Annie enjoyed the Passover dinner. She especially liked the idea of matzoh balls, but was disappointed when she couldn't play with them. So Mommy got Annie her very own Matzoh ball. Now we spend Passover at the beach! Yes. Annie is a very happy dog! Especially when she can claim a new toy as hers! BearHUGs & RosyPoodleKisses! 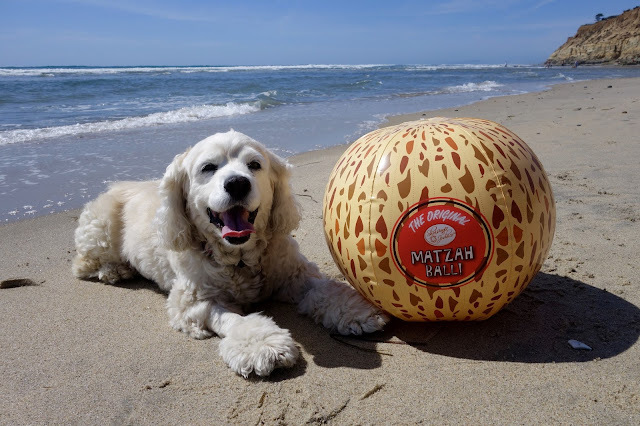 A Passover party at the beach....Matzoh's for everyone !! Woofs Bosco. Oh it would be so fab if you were there too Bosco! BearHUGs & RosyPoodleKisses! What a great toy, Annie, and a way for you to enjoy a matzoh ball!